Evo arrived in Venezuela from New York where he had participated in the launch of the International Year of Indigenous Languages in the United Nations. 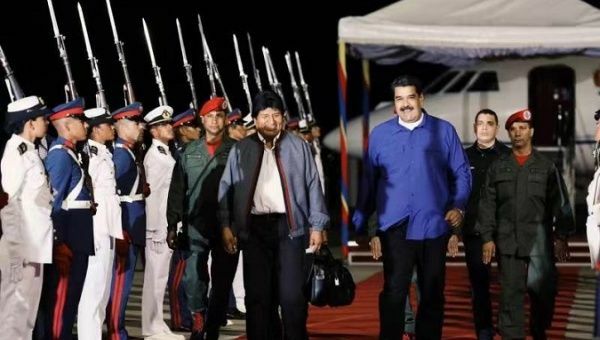 The president of Bolivia Evo Morales arrived in Venezuela Friday evening and held a meeting with his counterpart Nicolas Maduro in a show of support and solidarity for the Venezuelan leftist government against the U.S.-led coup and intervention. “We met with the brother president of Venezuela, Nicolas Maduro and we expressed our full support against the interventionist coup of the empire that seeks to take over the Venezuelan riches, violating international law. Bolivia supports dialogue to avoid confrontations,” Morales said in his Twitter account. For his part, President Maduro called the meeting with the Bolivian leader extraordinary and expressed his gratitude for the support of Evo Morales to his government and the Venezuelan people. “Extraordinary meeting with Brother President @evoespueblo, who after participating in the launching of the International Year of Indigenous Languages at #ONU, came to express his support and support for the aggressions of the US empire. Thanks, Bolivia, Gracias Evo!” he said in a tweet Friday. Evo arrived in Venezuela accompanied by the Bolivian Foreign Minister Diego Pary from the U.S. city of New York where he had participated in the launch of the International Year of Indigenous Languages in the United Nations. The United States and its right-wing allies in Latin America have come out in support of a parliamentary right-wing coup against the Venezuelan government of socialist President Nicolas Maduro after they supported a decision by opposition lawmaker, named Juan Guaido, to declare himself an “interim president” of Venezuela on Jan. 23 in violation of the country’s constitution. Washington, Canada and members of the so-called Lima Group, which include Brazil, Argentina, Colombia, Peru, Paraguay, and others were quick to recognize Guaido as “interim president” with the government of Donald Trump and his advisors urging the country’s military to step in and rebel against Maduro. The military has repeatedly stated its full support for the Maduro government and rejected such calls as interventionist and a breach of the sovereignty of Venezuela. Be sure to click the SOUND icon (on the right) on.